Obviously, her critics and all the “wise” anti-saturated fat folks irritated her, as you can read about in this article from 1990. Sadly, they convinced her to eat only 2 tablespoons of butter a day! Little did she or any of them know at the time that the French had it right, and butter is actually good for us! Now, one more. It’s fairly long (11 minutes or so), but a cute interview if you’re still completely into the whole Julie & Julia thing like I am. In fact, I really want to see the movie again now that I’m so into this book. I feel like I know Julia Child better now and I’d catch a lot more the second time around. Have you seen this letter written by Jeanmarie to Nora Ephron? I’m on the waiting list at the library for more Julia Child Books , and when I see which cookbook I can’t live without, I’m buying it. I’ll let you know what I pick. 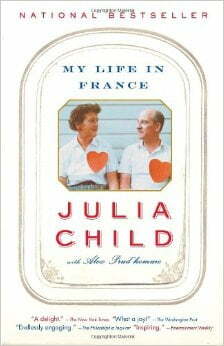 Do you have a favorite Julia Child cookbook or even a favorite recipe to share with us? I’ve been making mayonnaise for a while now, and it comes out okay. But I took one little snippet from the movie and made perfect mayo today. A throwaway line and voila, perfect! I’m asking for a full set of everything “Julia” for Christmas. Sure wish it included Le Creuset! Hi – love going down memory lane with all the clips. I, too, fell in love with Julia all over again. I have read anything I can get my hands on over the past 10 years. Now, I am doing it all over again after seeing the movie. Shauna – I have been lucky enough to not only get both my MTAFC at used cookbook stores/garage sales….. they are both 1st editions! I will probably go out and buy new for everyday use so as not to beat up the 1st editions. Kelly – long time reader, first time poster… thanks for all you do! Keep up the good work….I’m glad to have found you and Ann Marie. Shauna, can you share the roasted chicken recipe, please? It was fun to meet the legend after all the years I remember my mom watching her show. We are in DC and saw the Julia Child’s Kitchen exibit at the Museum of American History on The Mall. Fun to see all her gadgets! They were showing a 90 min film about her and those who were/are influenced by her. I enjoyed seeing all the old B/W out takes from her early years. They sell the CD at the gift shop. Hi Kelly I discovered your blog a few weeks ago through Jo-Lynne (Musings of a Housewife) and must say THANK YOU for sharing all of your knowledge about healthier eating. We have switched to organic whole milk and are working on making more changes as well. 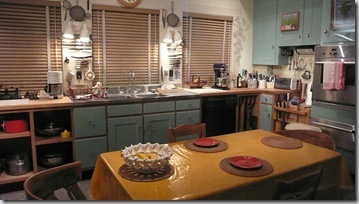 I just saw Julie & Julia yesterday, fell deeply in love with it and Julia herself. Had to grab the book on the way home. Now I want to read more about her, especially My Life in France. What a pioneer she was! Thanks for all the quotes and clips. Fun! Don’t you just love talking about Julia? I’m so glad I’m not the only one! Jessie, doesn’t that book make you want to see the movie again? Julie, those burgers sound SO stinkin’ good, I cannot wait to make them!!! Rebecca & Shauna, I also can’t wait to try that chicken!! Shauna, I’d love to find her cookbooks for $1 – what luck, girl! I went out and bought Mastering the Art of French Cooking Vol 1 the day after I saw the movie (pricey – but worth it in Hardback! ), I already owned Vol 2 (which I found at a used book sale for $1!). The first thing I made was the roast chicken – did it just like Julia said……. and it was the most amazing roast chicken I have EVER had! I had “thought” I was roasting chickens before, but I was really merely baking them. The pan drippings were absolutely divine. I can’t say enough about that meal. Oh – and of course, I had one of those big chickens that I got directly from the farm I buy from…. made all the difference! I love Julie! I’ve made several other things from her book…. and having lived in France, and watched my own “French mother” cook (when I was an exchange student), I have a real love for French cooking, and their philosophy of food and meals. I just saw your clip of the interview of Julia–the french fry interview. Where does a person get beef tallow? When I was first learning to cook at about 11, I remember stealing into my mother’s Julia Child cookbook and being completely and totally entranced. The food just seemed so … glamorous. I loved to sit there and read, read, read. I still love to read cookbooks. My favorite Julia episode is one where she helps the viewers get over the fear of making omelettes. She must have made 20 in that short segment! A classic line was her instructing that any number of fillings can go into an omlette–“why you can even fill one with liver for when your mother in law is visiting. ” One of my favorite recipes of hers is what has become known as “Julia’s burgers”–I got this recipe from my brother in law. You mix ground beef with grated (not chopped) onion–about 1/4 cup. Mix in fresh bread crumbs and milk and seasoning to taste. Form into burgers and then coat each patty with flour. Fry in butter. This recipe has evolved as it got passed on to me, but the basics are there. The burgers develop a nice crust as they cook. I would love to have the roasted chicken recipe. This week I am roasting a chicken and needed a good true and tried recipe. I’m running out the door & did a quick read of your post & can’t wait to come back & watch the clips. I am currently reading “My Life in France” and am enjoying it a lot. It has so much more in it than the movie. It seems to me that in many cases, Nora Ephron took more of the spirit of the thing & less actual events for the movie. For example, there’s no mention of the hat-making or bridge playing. There’s nothing in the book about Julia’s interraction with the fellow students at Cordon Bleu that is anything like the onion chopping incident in the book or the lobster recipe. Though perhaps they really happened & Nora took them out of letters that were saved – apparently there is a huge corpus of letters from both Julia & Paul Child.